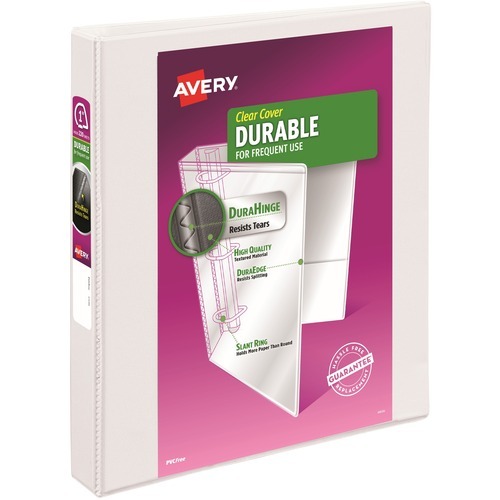 Avery Durable Reference View Binder - Letter - 8.5\" x 11\" - 175 Sheet - 1\" Capacity - 1 Each - White - Welcome to TABS! Durable view binder features an EZ-Turn ring design for smooth page turning. Gap-Free ring design prevents gapping and misalignment of rings so sheets of paper stay put. Secure loose and unpunched pages in the two interior pockets. Vinyl binder holds 8-1/2\" x 11\" documents. Durable view binder features an EZ-Turn ring design for smooth page turning. Wide front and back binder panels fully cover standard dividers and sheet protectors. Gap-Free ring design prevents gapping and misalignment of rings so sheets of paper stay put. Pages lie flat with back-mounted rings. Exposed rivets on back. Secure loose and unpunched pages in the two interior pockets. Vinyl binder holds 8-1/2\" x 11\" documents. Assembly Required: No Binder Capacity: 1"